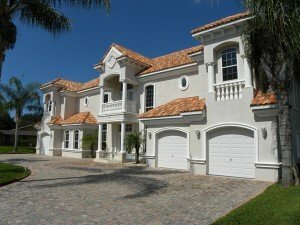 Hurricane Clean provides pressure washing services for both Residential and Commercial needs. We’ll clean everything from the exterior of your home or business to the fine details like curbs and hard to reach places such as your pool enclosure and roof using a safe chemical roof cleaning solution. Learn more about our pressure washing services below. Pressure washing has to be one of the most affordable and easiest solutions to increase your property value, and a good way to prevent cost, time, and trouble of future repairs. Here in Florida’s climate, mildew can be an issue. Having your house, driveway, deck and fence pressure washed will hold mildew at bay, while protecting your home’s value. Sometimes the added expense of a new paint job can be overcome with a thorough pressure cleaning. It’s not only less expensive, it gets done faster and with less mess! Avoid those nasty letters from your HOA, and get your house pressure washed, Today! When it comes to commercial work… We have the experience! From banks and hotels to docks and restaurants we have the resources and the knowledge to get the job done! Our expert staff will always conduct themselves in a respectful and professional manner. Is your pool area looking a little “Green” but not in a save the planet kind of way? Is there algae all over the screens and rails of your enclosure? Well we can help with that! Cleaning these areas is one of our most popular services. There is some specialized equipment that we use to clean those hard to reach areas of your screen enclosure. We do not use ladders to clean an average pool enclosure! Cleaning screens can be a little risky for most people but we have the expertise to get the job done without causing damage to your screens! With our affordable rates we can keep that favorite portion of your home clean all year! Power Washing can bring that new wood look back to your fence! Many customers have been shocked by the results! By removing that top layer of old wood that has been exposed to the elements you can bring that old fence back to life. After pressure washing wood of any kind whether it be a fence or a deck we recommend sealing the surface. This will help protect the wood as well as keeping it looking good. Wood is not the only type of fencing that we clean; pvc, brick,concrete and foam core walls are also an example of some of the surfaces we can clean. At Hurricane Clean we use flat surface cleaners to clean driveways! You will never see us cleaning driveways and sidewalks with a wand! This is for a couple reasons: one being that the flat surface cleaner gives a much more evenly cleaned surface than a wand with a single tip. Secondly the flat surface or “Hurricane” cleaner will cut the time spent on a project dramatically! This is how we can charge such affordable rates! This method of cleaning is effective for a variety of different surfaces from pavers to painted concrete.